A panel mounting BNC connector with a moulded plastic body has been added to Cliff Electronics’ FeedThrough connector range. The new BNC RF coaxial connecter is available in 50 and 75 Ohm versions and is fully compatible with existing products and applications while offering customers cost and weight savings. The Cliff FeedThrough series of true, feed through, data connectors for electrical and electronic instrumentation are suitable for developing custom I/O configurations for wall plates, enclosures and rack panels. 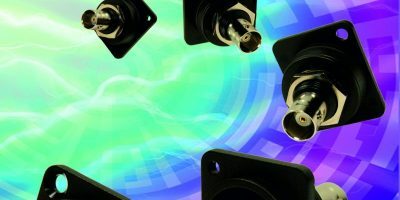 All connectors fit within a standard XLR panel cut-out and use common standard cabling for front and back connections with no soldering or screw terminal connections required. The connectors may be mounted from the front or back of a panel and a low rear profile accommodates the tightest behind-the-panel spaces. The plastic BNC connectors are nearly half the weight of a conventional version, weighing around 15g compared to metal versions at around 28g. Weight sensitive applications include mobile devices, instrumentation and avionics systems. John Hall, managing director of Cliff Electronics, believes: “The BNC connector is widely used for RF signals, video, test equipment and instrumentation. In addition to the lighter weight of our new connector there is a cost saving to customers of around 20 per cent.” The company can also supply the plastic BNC connectors pre-assembled into rack panels. Versions available include GJ45, HDMI, BNC and USB3.0 compliant single and dual USB versions in addition to the existing range which provides analogue, digital and optical feed-through connectivity in formats including Firewire, HDMI A-A and 50 ohm BNC versions, USB2 A-to-B and B-to-A “gender change” sockets high speed USB Type – C, USB3 to USB3 in all gender changing configurations – A-A, A-B and B-A. Also available are all popular data and Ethernet connectors including USB 2.0 and 3.0, LC and SC fibre (duplex and simplex), UTP and FTP RJ45s in both Cat6 and Cat5e (shielded and unshielded), Toslink, RCA Phono and HDMI and blanking plates. All versions of Cliff’s XLR footprint connectors are in full production.